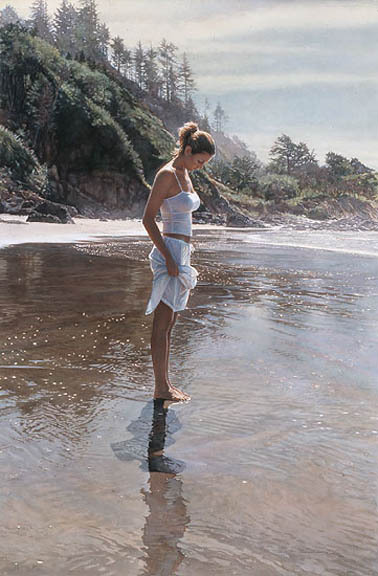 New Shoreline, like all of Steve Hanks' work, is rich with layers of symbolism and meaning. His titles are often the key to understanding the deeper message waiting to be discovered in each painting, and they often have more than one meaning. This young woman stands on a new shoreline that is unfamiliar and yet it opens a new world of opportunities. Waves wash away the superficial layers of her past as she prepares herself for the many challenges and possibilities the future offers.